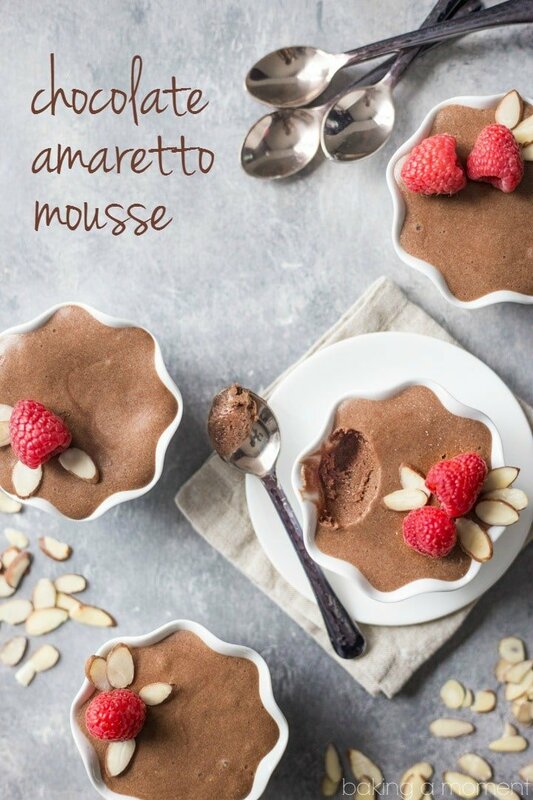 Chocolate amaretto mousse, made the French way! Taste the difference in every bite! With a hint of sweet almond to make it even more special. Finally! 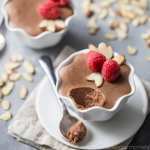 I think I’ve landed on the best classic French chocolate mousse recipe of all time. I have made a lot of chocolate mousse-y things, like this Nutella Pie and this German Chocolate Mousse, but they have all been “shortcut” chocolate mousse recipes. 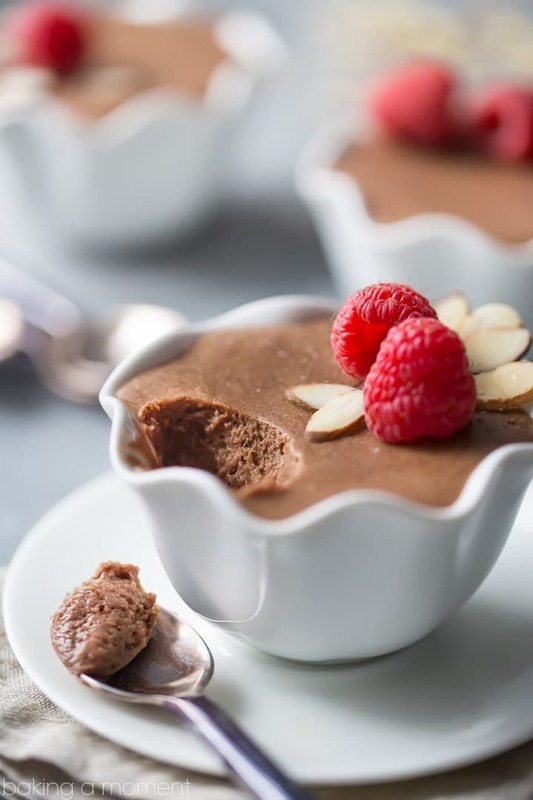 When I was a kid growing up, my mom always made chocolate mousse for special, grown up occasions. I think she probably used Julia Child’s recipe, which is what I’ve adapted here. It was so good! And it has lived in my memory for decades. I remember she made it with eggs. And this version has them, as well as lots of butter and chocolate. Really, it’s only a few simple ingredients, and it’s pretty quick to make. But the rich taste and airy-light texture will blow you away. You can really tell that this chocolate amaretto mousse is something special. I can’t think of a more perfect last-minute Valentine’s Day treat for your love. You can whip it up in the afternoon and it will be ready to enjoy by dinnertime! To me, the hint of delicate almond flavor you get from the amaretto liqueur takes this dessert to another level. But if you just want a classic chocolate mousse, feel free to substitute with water. 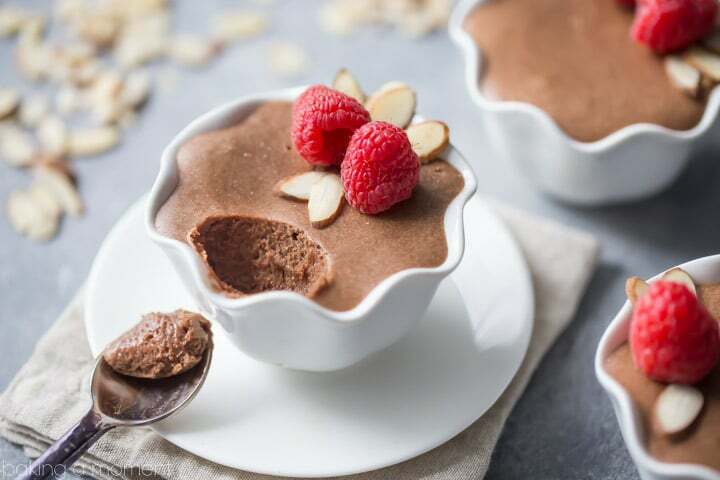 I have been meaning to post a real-deal chocolate mousse recipe for ages, but it was an old friend that finally gave me the push I really needed. Thanks Julie! This one is for you- I hope you love it as much as I did! PS- It’s gluten-free! Now that’s what I’m talking about! Love soft and creamy spoon-able desserts? Follow my Ice Creams, Mousses, Custards, and Puddings Pinterest board! Place the butter, chocolate, and amaretto (or water) in a small bowl and microwave in 15 second intervals, stirring, until melted and smooth. Set aside to cool. Place the egg yolks, sugar, and water in a medium mixing bowl and place over a small pot of barely simmering water. Cook, whisking, until pale and airy. Remove from the heat and and continue whisking on medium-high speed until cooled. In a large mixing bowl, whip the egg whites and salt until stiff. Stir in the extract and fold in the chocolate mixture. Transfer to 4-ounce serving dishes, and chill. I can’t help but agree Julia! So happy you like it; thanks for the sweet comment. Oh that’s so great to hear! I hope you enjoy it as much as I did. Thanks so much for the sweet comment! This looks super delicious! My family loves chocolate, so I’ll be making this real soon. Where did you get the bowls? I love them! Hey Karen! Thanks! I got them at Pier One- I think they were like 99 cents a piece. So glad you like the recipe! Chocolate and amaretto are so good together!